An increasingly acidified Pacific Ocean is dissolving the shells of tiny marine snails that live along North America’s western coast. The broad finding, which has surprised some researchers, suggests that sea life is already being affected by changes in the ocean’s chemistry caused by rising carbon dioxide levels in the atmosphere. “It really changes the game” by demonstrating that acidification is having a noticeable impact, says biological oceanographer Jan Newton, co-director of the Washington Ocean Acidification Center at the University of Washington, Seattle. Newton was not involved in the study. The researchers studied one kind of pteropod, common planktonic snails known as sea butterflies for the winglike body parts that help them glide through the water. Like other shellfish, pteropods use dissolved carbonate in seawater to build their shells. But laboratory studies have shown that the process can be disrupted, and shells can dissolve, as seawater becomes more acidic, or lower in pH. (Temperature has an impact, too.) As its concentration rises in the atmosphere, carbon enters the ocean through chemical reactions, causing its pH at the surface to drop by 0.1 units since the preindustrial era. That’s raised fears that marine ecosystems could be affected. Outside the laboratory, however, just a handful of studies have linked falling pH levels to damaged shells. In 2012, researchers documented damage to oysters in hatchery tanks in Oregon fed with seawater that had become more acidic as a result of offshore upwelling patterns. The same year, researchers reported that pteropods collected at one site in the Southern Ocean around Antarctica showed signs of shell damage. To gauge how acidification might be affecting the Pacific, biological oceanographer Nina Bednaršek of the National Oceanic and Atmospheric Administration (NOAA) in Seattle and colleagues collected pteropods at 13 sites during a 2011 research cruise between Washington and southern California. Back at the lab, they used a scanning electron microscope to examine the fragile shells, which are 1 cm in size or smaller. Normally, healthy pteropods have smooth shells. But more than one-half of these shells showed signs of dissolution, they report in the Proceedings of the Royal Society B. The pitted textures made them look like “cauliflower” or “sandpaper,” Bednaršek says. What’s not clear from this study is how such damage might be affecting pteropod populations or the broader ecosystem. 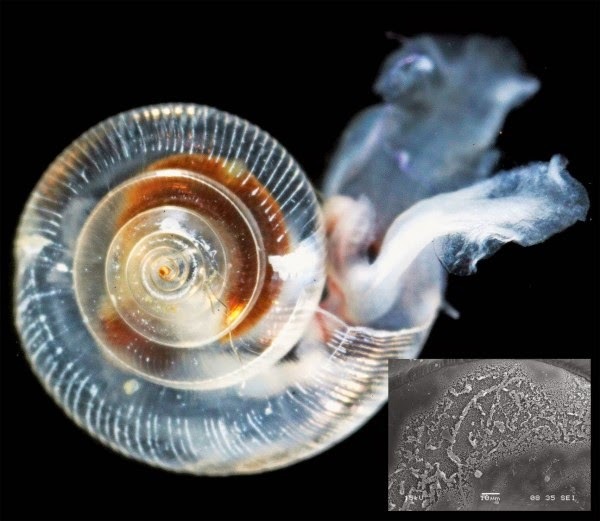 Previous work has suggested that shell damage can make it harder for the invertebrates to fight infection, maintain metabolic chemistry, defend themselves against predators, and control buoyancy. And while the snails are one of the most abundant organisms on Earth, “their role in ecosystems is generally not all that well known,” writes biological oceanographer Gareth Lawson of the Woods Hole Oceanographic Institution in Massachusetts in an e-mail. But “they can be important prey items at some times and places” for fish and other creatures. For example, the pteropod examined in this study, Limacina helicina, is a key food for fish eaten by pink salmon, an important North Pacific fishery. The waters probed during this study, known as the California Current, are a hot spot of ocean acidification because of coastal upwelling, which brings naturally acidic waters to the surface, where they are made even more acidic by greenhouse gas pollution. But Richard Feely of NOAA, a co-author on the study, says that the site serves as a “harbinger” for what global seas will be experiencing decades hence.